Thanks to their abundant tunefulness, exuberance and virtuosity,Bach’s concertos for solo keyboard and string orchestra remain widely popular with audiences and performers. Written originally for harpsichord, they are performed today equally often on modern piano. From 1729 to 1741, Bach was director of the Collegium musicum in Leipzig, a student musical society, founded by Georg Philipp Telemann in 1703 and run before Bach by Balthasar Schott. The Collegium musicum often gave performances at Zimmermann’s coffee-house. It was for these occasions that Bach produced his harpsichord concertos, among the first concertos for keyboard instrument ever written. It is thought that the multiple harpsichord concertos were heard earlier than those for one harpsichord, perhaps because his sons C. P. E. Bach and W. F. Bach (both excellent harpsichord players) were living at home until 1733 and 1734, respectively. It is likely that Johann Ludwig Krebs, who studied with Bach until 1735, also played harpsichord in the Collegium musicum. The concertos for one harpsichord, BWV 1052-1059, survive in an autograph score (now in the Staatsbibliothek Berlin, Mus. ms. Bach P 234) which is not a fair copy but a draft, or working score, and has been dated to about 1738. Bach may of course have played the works much earlier, using the parts from an original melody-instrument concerto and extemporising a suitable harpsichord version while playing. The works BWV 1052-1057 were intended as a set of six, shown in the manuscript in Bach’s traditional manner beginning with ‘J.J.’ (Jesu Juva) and ending with ‘Finis. S. D. Gl.’ (Soli Deo Gloria). Aside from the Brandenburg concertos, it is the only such collection of concertos in Bach’s oeuvre. The concerto BWV 1058 and fragment BWV 1059 are contained at the end of the score, and are an earlier attempt at a set of (headed J.J.) which was abandoned for one reason or another. Bach’s harpsichord concertos were, until recently, often underestimated by scholars, who did not have the convenience of hearing the benefits that historically informed performance has brought to works such as these: for instance Albert Schweitzer wrote ‘The transcriptions have often been prepared with almost unbelievable cursoriness and carelessness. Either time was pressing or he was bored by the matter.’ Recent research has demonstrated quite the reverse to be true; he transferred solo parts to the harpsichord with typical skill and variety. Bach’s interest in the harpsichord concerto form can be inferred from the fact that he arranged every suitable melody-instrument concerto as a harpsichord concerto, and while the harpsichord versions have been preserved the same is not true of the melody-instrument versions. Versions of the works have been very easy to come by over the years with every pianist on a recording contract trotting out their version, Some were romantic and others clipped in their baroque authenticity. Up to now, the version most often played here at Augusta de Mist was the fellow-Canadian Glenn Gould’s versions which will be the gold standard as long as these works are performed. 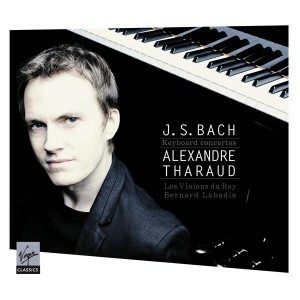 On this new album, rising-star young French pianist Alexandre Tharaud presents four of Bach’s seven solo keyboard concertos, plus a couple of arrangements. Tharaud has selected the concertos which, in his opinion, are “best suited to the piano”. He does not say how he has reached that conclusion, however, and some may disagree with his view. The dark and stormy D minor concerto, for example, is certainly the most substantial, and understandably one he is keen to tackle. But its pungency and dramatic bite are dampened when it is played on a plush grand piano – especially the 1980s Yamaha which Tharaud says he chose for its warmth and mellowness. This is an interesting decision: the full-bodied, soft-grained piano sound is often at odds with the impressively crisp and buoyant playing of the strings of Les Violons du Roy. As if to compensate for the piano’s lack of brilliance and immediacy, Tharaud is suitably heavy-handed – he punches out Bach’s heart-stopping cadenza in the first movement of D minor concerto, and almost over-eggs passages in a breathless account of the sunny D major concerto. It is very much HIS version. Tharaud is dazzlingly nimble-fingered and often admirably sensitive, without romanticising. The sublime Adagio of the F minor concerto is beautifully rendered, delicate and loving but never losing its forward momentum. The stylish orchestral contribution, directed by Bernard Labadie, ensures a welcome lightness of touch. Tharaud’s own arrangement of the concerto for four harpsichords (itself an arrangement by Bach of aVivaldi concerto for four violins) is cleaner in texture than the original but, in boiling down four solo keyboard parts to one, the work’s almost manic exhilaration is inevitably lost. Tharaud’s gentle, intimate account is, nonetheless, enjoyable on its own terms. Overall this is an appealing album – a pianist’s take on these wonderfully life-affirming concertos, with much to delight anyone who is already familiar with them (in any form), or for those who are exploring them for the first time or indeed, the hundredth. The Canadian connection is still alive in this recording: Les Violons du Roy is a French-Canadian chamber orchestra based in Québec City, Québec. The orchestra’s principal venue is the Palais Montcalm in Québec City. The orchestra also performs concerts in Montréal at the Place des Arts, the Montreal Museum of Fine Arts and St. James United Church.